This is really not my kind of watch. Or at least it didn’t used to be. Found this one really cheap and just had to see what quality it represented. Titanium watches really doesn’t age well and neither had this one. But it was a totally fine quartz beater. Didn’t pay more than $100. 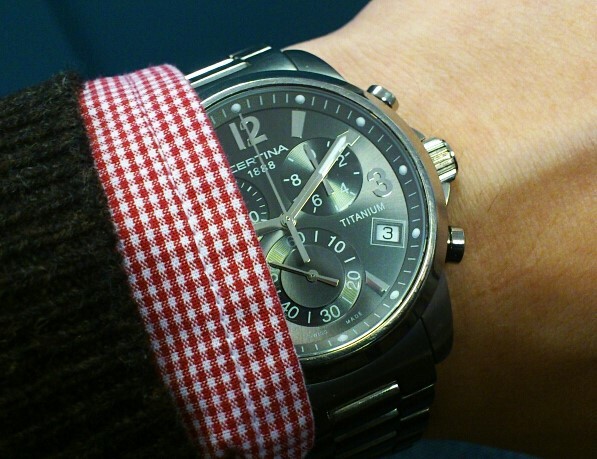 Newer Certina’s is nothing that turns me on. They express nothing about its wearer. Still, the brand has got a lot of history and has a whole line of sought-after vintage dive watches. Even though Certina are mass-produced by the millions today they still uphold a high quality in their segment of watches. Hadn’t this one been made of titanium it’s most likely I wouldn’t have bothered giving it a try and even though titanium looks terrible it still is a cool material that suits a tool watch. #158 - The Certina DS Podium Titanium Chronograph. Not sure about the ref. but I think it's a C536.7129.12.66. Please let me know if this is wrong.